The demand for organic produce has grown exponentially over the past two decades. Americans spent over $26 billion on organic produce in 2010 compared to just $1 billion in 1990 (1). Every year, the Environmental Working Group (EWG) releases the Dirty Dozen™ — a list of the 12 non-organic fruits and vegetables highest in pesticide residues. This article lists the latest Dirty Dozen foods, separates fact from fiction when it comes to pesticide use and explains simple ways to reduce exposure to pesticides. What Is the Dirty Dozen List? The Environmental Working Group (EWG) is a non-profit organization that focuses on educating the public on issues like agricultural practices, natural resource protection and the impact of chemicals on human health (2). Since 1995, the EWG has released the Dirty Dozen — a list of conventionally grown fruits and vegetables with the highest levels of pesticide residues. Pesticides are substances commonly used in agriculture to protect crops from damage caused by insects, weed pressure and diseases. To compile the Dirty Dozen list, the EWG analyzes over 38,000 samples taken by the USDA and FDA to single out the worst offenders (3). The EWG states that this methodology “reflects the overall pesticide loads of common fruits and vegetables” (3). While the EWG claims that this list can help consumers avoid unnecessary pesticide exposure, some experts — including food scientists — argue that the list is scaring the public away from consuming healthy foods. Pesticides are tightly regulated by the USDA, and recent reports indicate that pesticide levels found on 99.5% of conventional produce are well below recommendations set by the Environmental Protection Agency (4). The USDA Pesticide Data Program ensures that the U.S. food supply “is one of the safest in the world,” due to rigorous testing methods (4). However, many experts argue that continuous exposure to pesticides — even in small doses — can build up in your body over time and lead to chronic health conditions. For these reasons, the EWG created the Dirty Dozen list as a guide for people who want to limit pesticide exposure for themselves and their family. SUMMARY The Dirty Dozen is a list of fruits and vegetables with the highest level of pesticide residues created by the Environmental Working Group (EWG) to educate the public on food safety. 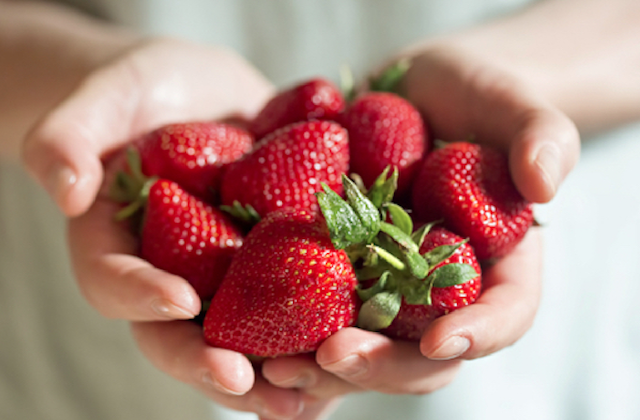 Strawberries: Conventional strawberries consistently top the Dirty Dozen list. In 2018, the EWG found that one-third of all strawberry samples contained ten or more pesticide residues. Spinach: 97% of spinach samples contained pesticide residues, including permethrin, a neurotoxic insecticide that is highly toxic to animals (6). Nectarines: The EWG detected residues in nearly 94% of nectarine samples, with one sample containing over 15 different pesticide residues. Apples: The EWG detected pesticide residues in 90% of apple samples. What’s more, 80% of the apples tested contained traces of diphenylamine, a pesticide banned in Europe (7). Grapes: Conventional grapes are a staple on the Dirty Dozen list, with over 96% testing positive for pesticide residues. Peaches: Over 99% of the peaches tested by the EWG contained an average of four pesticide residues. Cherries: The EWG detected an average of five pesticide residues on cherry samples, including a pesticide called iprodione, which is banned in Europe (8). Pears: Over 50% of pears tested by the EWG contained residues from five or more pesticides. Tomatoes: Four pesticide residues were found on the conventionally grown tomato. One sample contained over 15 different pesticide residues. Celery: Pesticide residues were found on over 95% of celery samples. As many as 13 different types of pesticides were detected. Potatoes: Potato samples contained more pesticide residues by weight than any other crop tested. Chlorpropham, an herbicide, made up the bulk of the detected pesticides. In addition to the traditional Dirty Dozen, EWG releases a Dirty Dozen Plus list that contains 36 more fruits and vegetables that have high levels of pesticide residues, including hot peppers, cherry tomatoes, snap peas and blueberries. SUMMARY Strawberries top the 2018 Dirty Dozen list, followed by spinach and nectarines. Several foods on the list contained multiple pesticides, including some that have been banned in Europe. There are conflicting opinions about the safety of pesticide use in produce. Though the pesticides used on crops are tightly regulated and kept well below harmful limits, there is concern over how repeated exposure to these substances affects health. Several studies have linked pesticide exposure to negative health effects, such as respiratory problems, reproductive issues, endocrine system disruption, neurological damage and increased risk of certain cancers (9). Children are considered to be at a greater risk of developing pesticide toxicity than adults due to their smaller size, reduced amounts of certain detoxifying enzymes and the fact that developing brains are more susceptible to neurotoxic pesticides (10). Studies have shown that children born to mothers with high pesticide exposure exhibited mental delays of up to two years, including deficits in coordination and visual memory (11). Childhood exposure to pesticides has also been linked to an increased risk of developing ADHD (12). Another study found that pregnant women who lived near farmland where the pesticides organophosphate, pyrethroid or carbamate were sprayed were more likely to have children diagnosed with autism or autism spectrum disorders (ASDs) (13). Furthermore, farmers who applied certain pesticides to their crops were found to have a higher frequency of obesity and colon cancer compared to the general population (14). Regarding pesticide levels in the body, research shows that swapping conventional produce with organic versions significantly reduces or eliminates urinary levels of common pesticides (15, 16). It’s clear that high levels of pesticide exposure are associated with adverse health effects. However, most of the available studies focus on individuals who deal directly with pesticides on a daily basis, such as agricultural workers, instead of the general public. SUMMARY It’s clear that exposure to high doses of pesticides is harmful. However, more research is needed to determine if long-term exposure to the low levels of pesticides found in food is detrimental to health. Does Organic Produce Contain Pesticides? While standards for organic farming are different from conventional farming practices, organic farmers are permitted to use certain approved pesticides on their crops. Organic farmers rely heavily on crop rotation, biological plant protection and hygiene practices to protect crops. However, organic pesticides, such as copper, rotenone and spinosad, can be used in organic farming (17). 25 organic pesticides are approved for organic use versus the staggering 900 that are currently allowed to be used on conventional crops (18). Just like pesticides used in conventional farming, organic pesticides are tightly regulated for safety but can be harmful to health in high doses. For example, occupational exposure to the organic pesticide rotenone has been linked with an increased risk of Parkinson’s disease (19). Unfortunately, long-term studies examining the risks of consuming conventional fruits and vegetables versus organic fruits and vegetables in the general population are lacking. If you’re choosing organic foods for environmental reasons as opposed to health reasons, research supports that organic farming has less of an environmental impact than conventional farming. Organic farming methods reduce carbon emissions, encourage biodiversity and protect the soil and groundwater (20). SUMMARY Pesticides used in both conventional and organic farming can be harmful to health in high doses. Should You Avoid Conventional Forms of Dirty Dozen Foods? Many people choose organic produce in hopes of reducing their exposure to pesticides. More evidence from research studies is needed to determine if an organic diet is healthier than a diet containing conventionally grown produce. For those with the ability to purchase organic versions of high-pesticide produce, using this practice will likely result in lower overall exposure to pesticides. However, it should be noted that pesticides aren’t just found in fruits and vegetables. They’re widely used on other crops like cereal grains, as well as on lawns, flower gardens and to control insects (21, 22). Since pesticides are so widespread, the best course of action to reduce your exposure is to choose organic foods when possible and practice more sustainable garden care and insect repelling methods. Since organic produce is often more expensive than conventional produce, it can be hard for many people to afford. Don’t worry if you’re unable to purchase organic versions of the Dirty Dozen. Eating plenty of fruits and vegetables far outweighs the risk of pesticide residues on produce, and there are ways to reduce these residues. SUMMARY While organic versions of the Dirty Dozen most likely contain fewer pesticide residues, consuming conventional fruits and vegetables is perfectly safe. Scrub them in cold water: Rinsing fruit and vegetables in cold water while scrubbing them with a soft brush can remove some pesticide residues (23). Baking soda water: A study found that washing apples with a 1% baking soda and water mixture was more effective in removing pesticide residues than tap water alone (24). Peel fruits and vegetables: Removing the skin of Dirty Dozen fruits and vegetables can significantly reduce dietary intake of pesticide residues (25). Blanching: In one study blanching produce (exposing it to boiling, then cold, water) led to a more than 50% reduction in pesticide residue levels in all vegetable and fruit samples except peaches (26). Boiling: A study found that boiling strawberries significantly decreased pesticide residues, with reductions of 42.8–92.9% (27). Rinse produce with ozonated water: Ozonated water (water mixed with a type of oxygen called ozone) has been found to be particularly effective in removing pesticide residues from food (28, 29). Using any of the above evidence-based practices can significantly reduce pesticide residues on fresh produce. SUMMARY Scrubbing produce under cold water, washing with a baking soda solution or peeling are all excellent ways to reduce pesticide residues on fruits and vegetables. The goal of the Dirty Dozen list is to let consumers know which fruits and vegetables have the highest amount of pesticide residues. While this list can be helpful for those who are worried about pesticide use in food, it’s not yet clear how concerned you should be over ingesting pesticide residues in the first place. For those who wish to err on the side of caution, it’s best to purchase organic versions of the Dirty Dozen foods. While the impact of pesticides on health is not yet fully understood, the importance of consuming fruits and vegetables for health, whether conventional or organic, is firmly established. Therefore, you shouldn’t limit your consumption based solely on pesticide usage. Jillian Kubala is a registered dietician. This article was originally published on Healthline.com.